Here are pictures, tell me what you think. Should I cut them now or wait? I know they are not edible after they flower. I'm just not sure what to do. Definitely harvest them. I don't grow them but when picking them at the store, I would consider the second one a bit open, and the first one too open. applestar wrote: Definitely harvest them. I don't grow them but when picking them at the store, I would consider the second one a bit open, and the first one too open. Thanks Applestar! You pretty much confirmed my thoughts. I actually considered just leaving the 2nd one to flower. I've seen pictures and they look really pretty. 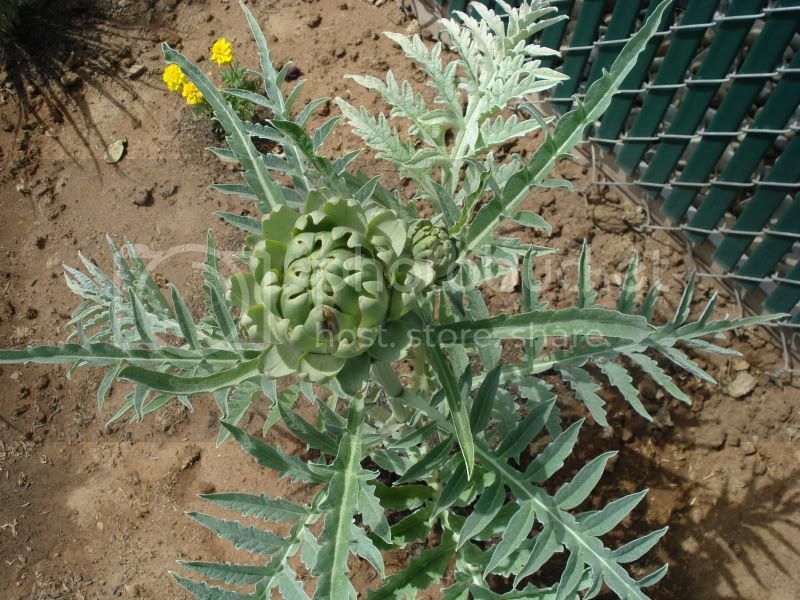 I have eaten artichokes since I was a little girl, they are very popular here in California. I kept thinking they were just too small and kept hoping they would grow a little bigger before I it was time to cut them. I just went outside and did the deed. Thank you again! Hey Applestar, just wanted to let you know that I cooked the artichokes I harvested today and they were absolutely delightful! I cant wait for more! Thanks again! I appreciate that you posted back to tell me. I love artichokes. One of those things that I can't stop eating once I start. Lucky you for being able to grow them in your garden! ...they should grow side shoots/buds now right? I see that one has two already. Inailum wrote: Here are pictures, tell me what you think. Should I cut them now or wait? I know they are not edible after they flower. I'm just not sure what to do. 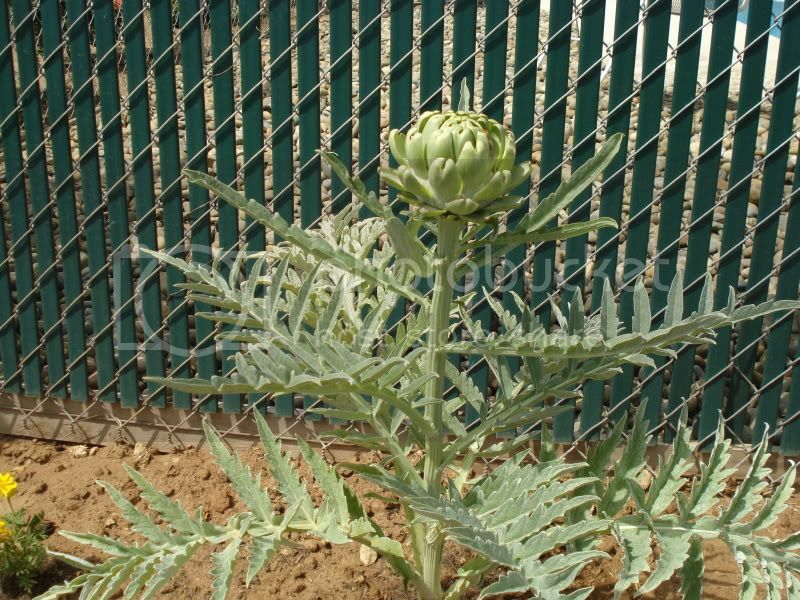 Are those artichoke plants second year plants or were they planted this season? I grew some several years ago and now have 5 in my garden and they do well in SE Louisiana. I never got a choke off the first year plant but did get several off them the second year they grew. The ones I now have are getting pretty big and the plants are robust but no sign of a choke. If they do like the last time I planted them, I'll not see a choke until sometime next year about this time of the season after over-wintering. Forgot to ask in my other post, just how do you like them cooked? My favorite is stuffed artichoke. I recently fixed 4 that I got from the local market that way and they were a huge hit. I also steam them and drizzle them with a bit of oil and vinegar, sea salt and pepper and eat them that way or use the hearts in soup like a good pot of oyster/artichoke soup. We had a restaurant in New Orleans that fixed the best "Seafood Stuffed Artichoke." They would lightly batter small bits of fish, shrimp, oysters and quick fry it then place that in one of the largest whole artichokes that had been steamed till very tender, then they'd cover that in one of the most intense dill sauces I've ever eaten. One artichoke, a good Italian Salad and an order of Garlic/Cheese/Spinach Bread and you had yourself a serious meal. 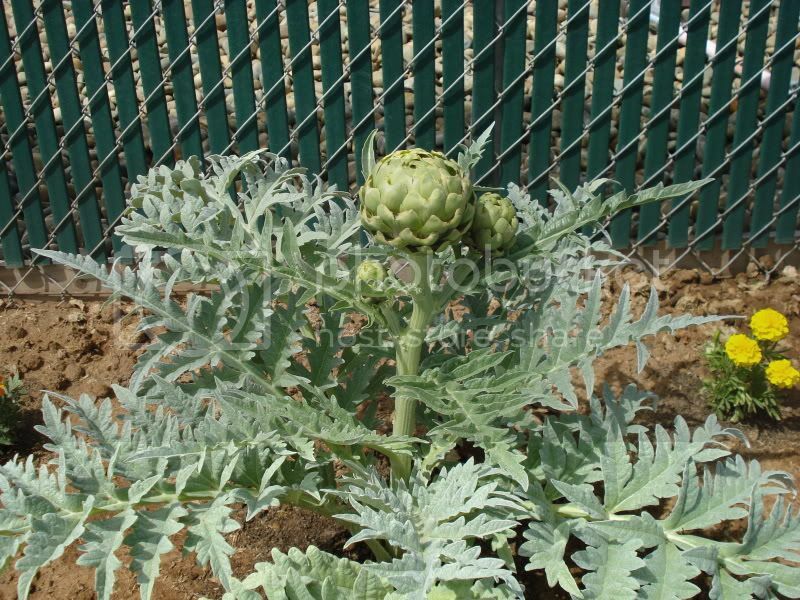 gumbo2176 wrote: Are those artichoke plants second year plants or were they planted this season? I grew some several years ago and now have 5 in my garden and they do well in SE Louisiana. I never got a choke off the first year plant but did get several off them the second year they grew. Usually when I prepare them I either steam or boil them and then add a little bit of olive oil and lemon juice. Of course if I'm feeling really unhealthy I will opt for the melted butter with a dash of salt and pepper, nummy! I have never had them stuffed but it sounds delicious! I saw a recipe online the other day I might try. The one with the seafood you told me about sounds absolutely heavenly! Oh my goodness, just talking about them makes my mouth water! Thanks for all your info. If you learn anything new please do share with me as I will do the same with you. I noticed that there aren't a lot of people on here growing them. They are missing out on one of lifes little treasures! applestar wrote: :D You are very welcome! A funny little story, I moved to a small town in Virginia for about 10 years and nobody there even knew what an artichoke was, nor did they know what a pomegranate was. lol About a year before I moved back to California I was in the grocery store there and I saw pomegranates!! Right next to them was an instruction booklet on "how to eat a pomegranate" I got a good little chuckle out of it. I guess on the west coast you get spoiled with all the wonderful fruits that can be grown here. There is a lot of info on the net about how to divide your plants from shoots they are producing. It is not that difficult and you can use the plants you already have to continue the harvest for years to come. They do like rich, well drained soil, but like it pretty moist, especially when producing chokes. The summer heat down my way makes the plant wilt a bit but they do come back when it cools. My plants only produced in the late spring since they like cool weather to form the chokes. My best advice for more info is to do a search. There's tons of it out there but you have to weed through it since some of it is pretty basic stuff. Here's how I stuff them for the family and they are very tasty and quite filling. Lay the artichokes on their sides and cut the top 1/3 off with a sharp knife. Use kitchen scissors to trim the sticky points off the top of the remaining leaves Using a spoon, dig the fine "Choke" material out of the center of the artichoke. Place the artichokes in a cool water bath to wash out any dirt. I'll place them upside down in my sink with cold water in it and shake them vigorously to get the excess water out. Set aside to drain upside down on paper towels. In the meantime, put about 2 tbsp. of olive oil in a saute pan and cook the onion until wilted but not browned, add the garlic and continue cooking for about 2 minutes on low heat so it doesn't brown, but imparts the flavor of the garlic. Remove from heat and put this in a large bowl. Now add the bread crumbs, parmesan cheese and remainder of olive oil and mix well. I like this mixture to be just moist enough that when I squeeze some in my hand, it holds together but will break up easily if I want it to. So you may want to add a little more olive oil to accomplish this. Take the raw artichokes and spread the leaves as much as you can without breaking it apart. Now hold the choke over the bowl with the mixture and put enough stuffing in each leaf to half fill the pocket. Start at the outside, bottom leaves and work upward to the center. Fill the centers where you removed the "Choke" material earlier with the spoon. Do all four chokes this way and then place a lemon slice on top of each Artichoke. Wrap them in aluminum foil to store in the fridge. They will stay good for about 5 days this way if you don't cook them right away. I use a large wok as my steamer. I'll open the top of the foil to expose just the top of the choke and steam it for at least 1.5 hours. Check for water level to keep the steaming process going. The choke is done when you can easily pull leaves away from the choke. Pull the leaves------ using you teeth, scrape the stuffing and tender pulp from the leaf and enjoy. Do NOT use any salt when cooking this dish. Between the seasoned bread crumbs and Parmesan cheese, you will have more than enough salt. Does anyone know why some artichokes have a nice, big heart and some are all leaves and a small (disappointing) heart? I just boil artichokes and dip the leaves in salty melted butter. When I get to the heart I want a big one to cut into chunks, dip and devour ! Sounds super yummy! Thank you! 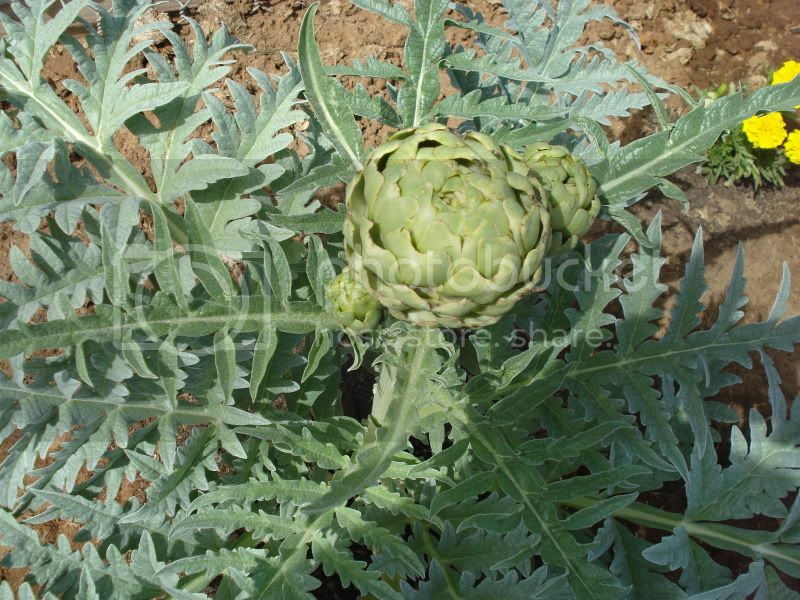 I might have to buy some artichokes and try it instead of waiting until my next harvest. Im excited! DeborahL wrote: Does anyone know why some artichokes have a nice, big heart and some are all leaves and a small (disappointing) heart? I have no idea. I have noticed that some are a little smaller but no huge difference. Are these artichokes that you have harvested or bought?